Native to WA, this striking mallee is known for its weeping 'silver' branches, attractive open growth and bell-shaped crimson flowers. 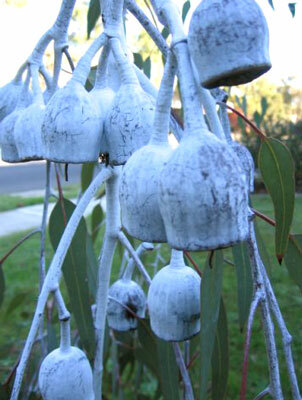 Features: Weeping pendulous branches with whitish bloom. Crimson flowers. Hardy. Drought tolerant. Applications: Feature tree in landscapes or gardens. Open canopy suits appropriate companion planting. 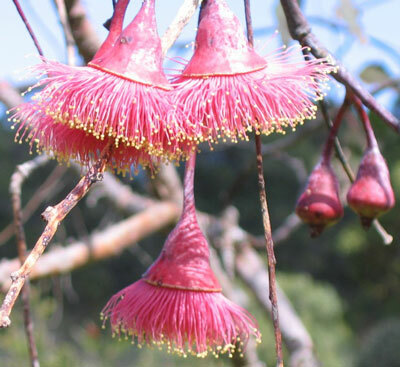 Description With the hardiness of a plant native to the wheatbelt, the Caesia can make a unique contribution to any water-wise garden or landscape. Bark peels in strips from the main trunk and the pinkish or white branches and nuts (which earns it the 'Silver Princess' name) that hang down are contrasted by long pendulous green leaves. 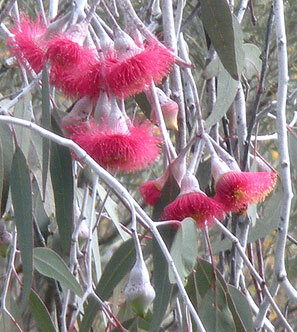 It shares the open growth habit of most sizeable mallee and can therefore share its site with other suitable plantings. Canopy: Open umbrella of cascading branches. Light shade. Growth rate: Medium to fast depending on conditions. Cautions: Branches may hang to the ground. Branches may break where their drooping weight is unsupported by the growth of the tree. Prefer dry summers to humidity. Tolerances: Dry summers. Low rainfall. Poor soils. Soil demands: Can tolerate poor soils with adequate drainage. 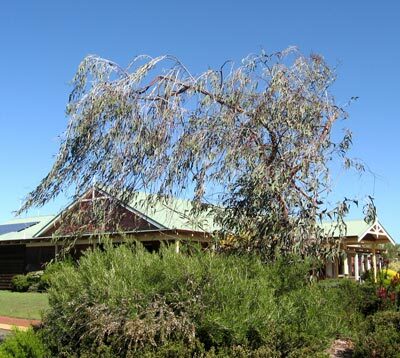 Boland, D. J. et al (2006) "Forest Trees of Australia" 5th Edition, Australia: CSIRO Publishing. Gilman, Edward F. (1997) "Trees for Urban and Suburban Landscapes", Florida: Delmar Cengage Learning. Lorenz von Ehren "Von Ehren Manual" 2nd Edition, Hamburg. Rushforth, K. (2001) "Easy Tree Guide, Britain and Europe", London: Aurum Press. Urban Forests Ecosystems Institute, "SelecTree - A Tree Selection Guide" retrieved from http://selectree.calpoly.edu/treelist.lasso 2009. Torbay Treefarmers makes all information on this website available in good faith to customers, based on experience, general knowledge and research and in so doing, makes no guarantee in any way about the accuracy or usefulness of this information, nor is any warranty made or inferred by the supply of this information, nor can Torbay Treefarmers be held responsible or accountable for any loss, harm or damage that may arise from the use or availability of any information on this website.